In 1968, the westerly and easterly extensions of the Bloor-Danforth subway line into Etobicoke and Scarborough marked a triumphant moment in the history of ‘Metro’ Toronto: rapid transit finally connected these suburban municipalities, and their residents, to the central downtown. Islington station supplanted Keele as the new western terminus, a full six stops away. 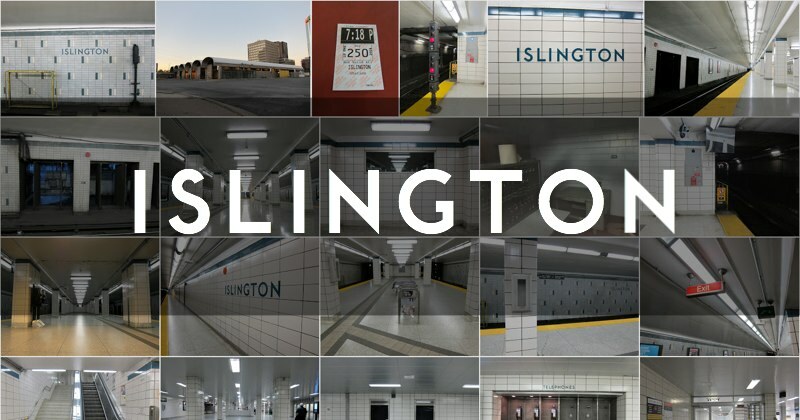 Understanding the historical context is key to our appreciation of Islington—a suburban station, serving Etobicoke as a hub for numerous feeder surface routes. Its existential purpose was to link travellers to the core (“Simpson’s... only 26 minutes from Islington Station” trumpeted one typical commercial advertisement). The individual covered bus bays and roomy interior ‘mall’ epitomize a particular era of station configuration, matched at the other end of the line by Warden and (in a previous iteration) at Eglinton. This type of layout is no longer seen as optimal for passenger efficiency; plans to demolish the bays and modernize the station have periodically circulated, but never quite materialized into actuality. The suburban weltanschauung is also evident in the commuter lots—described as ‘spacious’ in a TTC service notice from the period—that abut the station. Why fight traffic, when you can conveniently park at a suburban lot and ride the subway into town? Premier John Robarts unveiled a commemorative photo montage in the mezzanine at the opening ceremonies on May 10, 1968, but sadly no trace remains of the display. I wonder if it’s tucked away in a storage warehouse somewhere, along with other flotsam and jetsam from the TTC’s visual past?